A refined-looking sock, thanks in no small part to the luxury 100% mercerised cotton used, these Viyella Knee High Mercerised Cotton Socks offer a quality appearance and feel characterised by a lustrous smooth sheen and crisp handle, with a lightweight knit perfect for a dress sock. These sophisticated socks are reinforced at the heel for more durable wear, and closed with a hand linked toe for smooth seams without bulk or abrasion. 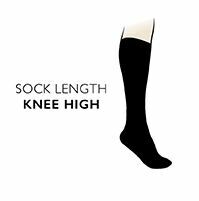 Viyella Mercerised Cotton Socks are also available in short and half hose lengths.